I've just returned from a few days abroad and noticed that Alexis has slowed down almost completely - bubbles happening once every 5 minutes at most. I guess that means it's done, or near as - I will consult the book tomorrow to see if it's clearing and bottling time or if I should give it some more time. It is quite exciting to finally get to this stage! Yesterday it looked like the B, C and D batches were about due a racking. 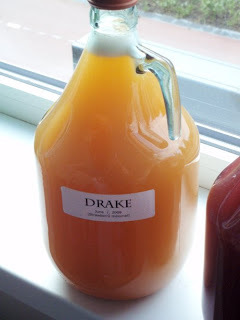 Drake dropped an enormous amount of sediment sludge in the few days it was in a demi, and seemed to be fermenting robustly enough that I figured it'd be okay racking it so soon. They've since all started bubbling again. And.. Drake has dropped more sediment, almost looks like I didn't take anything out at all. I knew this was coming! I have four batches bubbling away, so now... I wait. Not my strongest point! I have capacity for a 10 l batch but right now I want to see how the first batches turn out before I go anywhere near a large batch. The next batch is going to be called Ehle and I think that will be a summer honey (the good stuff, no more supermarket honey) with mint leaves. But I'm not allowing myself to start it before Alexis is bottled. Impatience, I has it. Something non fermenting today. In the book about meadmaking is also this recipe, and when I had extra fruit I figured it'd be a nice surprise for myself in the autumn. 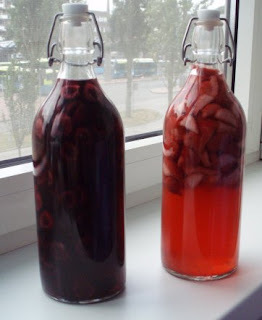 It's fruit (one cherry, one strawberry), sugar and vodka - should be nice in about 4 months. I've given it labels which say "Do not open before graduation" as I hope to graduate uni in October and it'd be a nice treat!